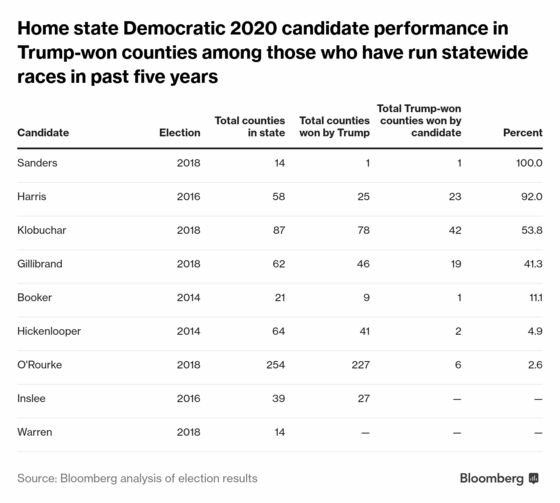 (Bloomberg) -- The path to the White House for Democrats runs, in part, through Trump country. Yet few of the candidates running for the party’s nomination have demonstrated much ability to win on the president’s territory. Only three of the major Democratic contenders hail from states Donald Trump won in 2016, and most of the candidates who’ve run for statewide office haven’t had to -- or been able to -- win where the president was strong, a Bloomberg analysis of county-by-county election results since 2014 shows. Senator Bernie Sanders is the early Democratic front-runner, according to surveys, and someone with a message focused on working-class Trump voters resentful of the power of corporate America and the wealthy. Still, he represents solidly Democratic Vermont where only one of 14 counties went for Trump. Sanders did carry that county on his way to re-election last November, though by his smallest margin in the state. Former U.S. Representative Beto O’Rourke comes from a Democratic stronghold in heavily Republican Texas, and he came within 2.5 percentage points of toppling GOP Senator Ted Cruz in the 2018 election. But he did that with an energized Democratic base and carried just six of the 227 counties Trump won in the state. The contest between president and the eventual nominee is likely to turn on a handful of Midwestern and industrial states where his promise to revitalize manufacturing and take care of what he called the “forgotten” Americans particularly resonated. About 77,000 votes spread across Wisconsin, Michigan and Pennsylvania provided Trump’s margin of victory in the Electoral College. A nominee who could win traditional Democratic-leaning states like Michigan and Pennsylvania might give the party its best shot of retaking the White House, said William Frey, a senior demographer at the Brookings Institution in Washington who studies political trends. “There’s a lot of evidence to suggest that if they played it safe this time, that might be the way to go,” he said. In a report published earlier this month, Frey found that there were broad shifts toward Democrats in the 2018 congressional elections -- including in the vast majority of Trump-won counties -- when Democratic and Republican vote margins were compared to the 2016 presidential election. Counties in the Upper Midwest were among those with the biggest swings. Nationally, Trump won roughly 84 percent of all counties and county-equivalents on his way to winning 31 states and an Electoral College victory, even as Democrat Hillary Clinton won almost 3 million more votes nationally with Democratic votes concentrated in densely populated urban areas. While there’s no realistic way to gauge who would be most competitive against Trump in an election still 19 months away, that isn’t keeping candidates from regularly making the case that their unique backgrounds and messages give them the best shot at beating him. Senators Amy Klobuchar of Minnesota and Kirsten Gillibrand of New York, have the strongest records in Trump areas. 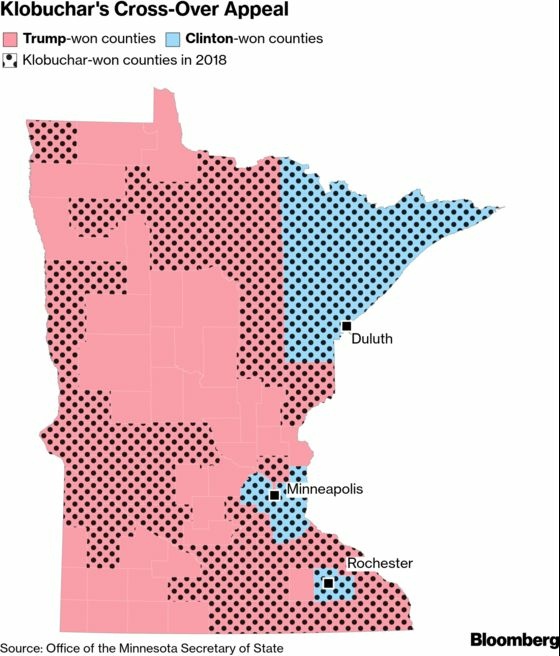 In her 2018 re-election, Klobuchar won just more than half -- 42 of 78 -- of the counties that voted for Trump two years earlier in a state that gave Clinton one of her smallest margins of victory. While New York is reliably Democratic in presidential elections, it has deep pockets of GOP support, mostly upstate, and Gillibrand took 19 of 46 Trump counties last year. 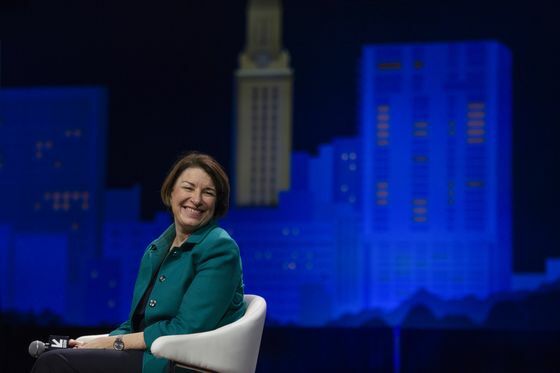 Both Klobuchar and Gillibrand, who has emphasized her electoral success as a congressional candidate in a formerly Republican district, won against little-known Republicans. Klobuchar argues her electoral record is something she could replicate in other battleground states. To stress that, her first official campaign appearance outside Minnesota in February was in neighboring Wisconsin, even before she headed to Iowa where the first nominating contest is held. The third-term senator has also challenged some policy ideas favored by the party’s ascendant progressive wing, betting that bucking that orthodoxy could help her stand out in a crowded field. The announcement earlier this month from Senator Sherrod Brown of Ohio that he wouldn’t enter the race took out of play a potential candidate with a record of winning in a purple state, including in counties Trump won. His decision arrived as it appears increasingly likely that former Vice President Joe Biden will run for a third time. Biden, who hails from deeply Democratic Delaware, could give primary voters their first clear front-runner and a candidate with a reputation for having working-class appeal that could help Democrats win back Michigan, Wisconsin and Pennsylvania, where Biden was born. In a Democratic Party increasingly leaning to the left, both Biden and Klobuchar hew more toward the middle. Yet that may not matter. Senator Kamala Harris of California, who has shown some early polling and fundraising strength, won 23 of the 25 counties Trump won in her state. But that result comes with a large asterisk. She ran against a fellow Democrat in 2016 because of California’s unusual open primary system. Former Colorado Governor John Hickenlooper, who formally entered the race March 4, has also stressed his record of winning in a purple state. But the two-term governor’s most recent victory in 2014 included just two the 41 Colorado counties that Trump went on to win in 2016. Washington Governor Jay Inslee, a proponent of dramatic action to reverse climate change and a vocal Trump critic, didn’t carry in his 2016 election any of the 27 counties in his state won by Trump that year. Senator Elizabeth Warren has been stressing her red-state Oklahoma upbringing more than her electoral record in Massachusetts, one of the nation’s most liberal bastions. Trump didn’t win any of her state’s 14 counties. Senator Cory Booker’s record in New Jersey isn’t much better. In his 2014 Senate race, he won just one of the nine counties Trump would carry two years later in a state that also leans heavily Democratic.